The death of an 18-year-old man in a flooded quarry is believed to be linked to the ice bucket challenge craze. 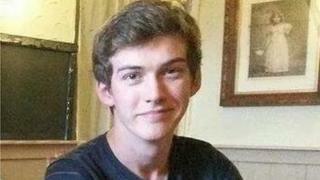 Cameron Lancaster, from Burntisland, Fife, died on Sunday evening. His family described his death as a tragic accident and "a great loss" and said Cameron would be hugely missed by family and friends. The emergency services were called to Prestonhill Quarry near Inverkeithing at about 17:00 on Sunday and a body was recovered four hours later. Police Scotland said inquiries are under way to establish the full circumstances of what happened, but it is thought the incident is connected to the ice bucket challenge. A statement from Cameron's family added: "During his short life, he touched so many people with his friendliness, kindness and thoughtful generosity of spirit."